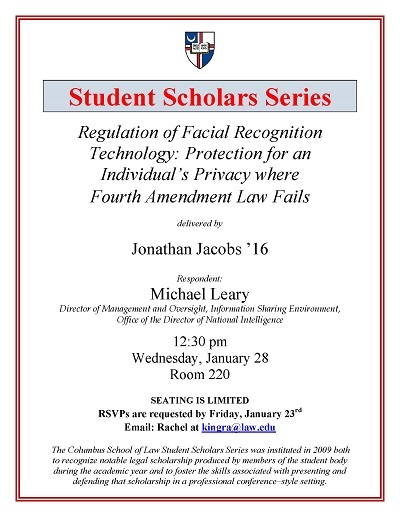 Jonathan Jacobs, Class of 2016, was the leadoff presenter on Jan. 28 in the Spring 2015 Student Scholar Series, offering an overview of how quickly the use of facial recognition technology is spreading. He concluded that current Fourth Amendment protections are outmoded and inadequate to shield citizens’ privacy. Jacobs suggested the creation of a central new Federal Facial Recognition Database that would be responsive to legislation specially designed to put parameters on its use, with certain exceptions. “The time to get ahead of this issue is now. Criminally and constitutionally, we need to make sure privacy is preserved,” said Jacobs. Jacobs, Jonathan, "Regulation of Facial Recognition Technology: Protection for an Individual’s Privacy" (2015). Student Scholar Series. 20.